That looks refreshing yet spicy!! I love it! Loved these. 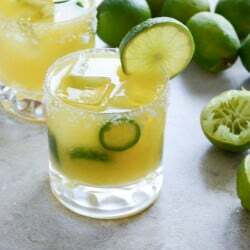 Just made them used a slght moderation, I used my juicer to juice a couple limes and the mangos for the simple syrup delish!!!! I rubbed my eyer two days ago while making harissa. These margaritas would´ve been a nice way of distracting myself! Fresh ‘penos and mango…what a Rita! I’m a 26-year-old Irish woman and I think you might be my soulmate. Don’t tell my boyfriend. Hello Jessica! I’m having a magazine giveaway on my blog if you’re interested! I’m a little wary of the jalapenos…but I’m sure this is as delicious as it looks! This sounds to die for. Very similar to a drink I’m trying to recreate (sacsayhuaman) from a great restaurant called Andina in PDX. I’ve had the hardest time trying to find a store that sells habanero pepper vodka, but this sounds like a great way to make it. I can’t wait try this drink, too! I just found your site today, and I have to say it’s totally awesome. But what spurred me to comment was, your I’d-rather-attempt-to-break-my-arms-and-carry-24-grocery-bags-at-once-than-make-a-second-trip-to-my-car-to-unload-them season. So freakin’ hilarious because I do the exact same thing. Long live millennials!! BTW, I’ve never had a good margarita (Chili’s anyone?) but I’m SO going to try this one! Yum! We just made blood orange jalapeno margaritas for National Margarita Day. This is going to be necessary post work on Friday. Love the spicy mango flavor! Pingback: Tint-spiration: Mango & Marigold | What Dress Code? 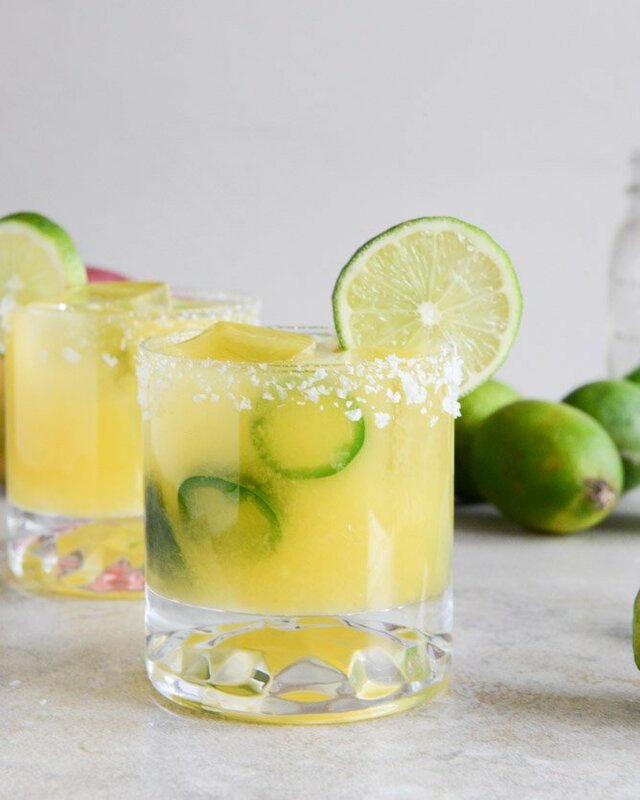 Pingback: Cinco de Mayo Recipe: Mango Guacamole + Mango-Jalapeño Margaritas | What Dress Code? My husband & I had these for the first time last night and LOVED them! We used frozen mangoes because that’s what we had, and we also let the jalapenos stay in the tequila for a few days in the fridge instead of just overnight…mainly just because we didn’t get around to straining it! I don’t know if that made a difference or not, but we like spicy stuff so we didn’t mind it extra hot. We will be making these again and again. Thanks!! think they got the best deal when they actually are mistaken. Pingback: hidden gems: welcome to summer 2013! | rhinestones of wisdom. Excellent site you have got here.. It’s difficult to find quality writing like yours nowadays. I seriously appreciate individuals like you! Take care!! may use them as soon as in a although at a restaurant or the motion pictures. Or you devote some considerable time clipping supercuts coupons online from multiple Sunday paper inserts. No matter how involved you’re, the suggestions within the following article can help you raise your game. hoped that you might be saving large like them? This short article can offer you excellent advice pertaining to haircut coupons. the most of it. Coupons can permit you to see huge discounts on each the necessary and nonessential things you buy daily. guide you in the use of gain coupons. ideal method of writing? I’ve a presentation subsequent week, and I’m on the look for such info. Presumably you got this receipe from the voli website….pictures are ironiclly the exact same…. Try muddling with cilantro at the start. Think aout a habenero simple syrup with regular silver tequila……….